I had to update this before I posted it. It really is not a three ingredient recipe. It is a TWO Ingredient Recipe. The Sugar is completely optional. I made this for breakfast since I originally wrote this, and found that I didn't need the extra sweet to it. 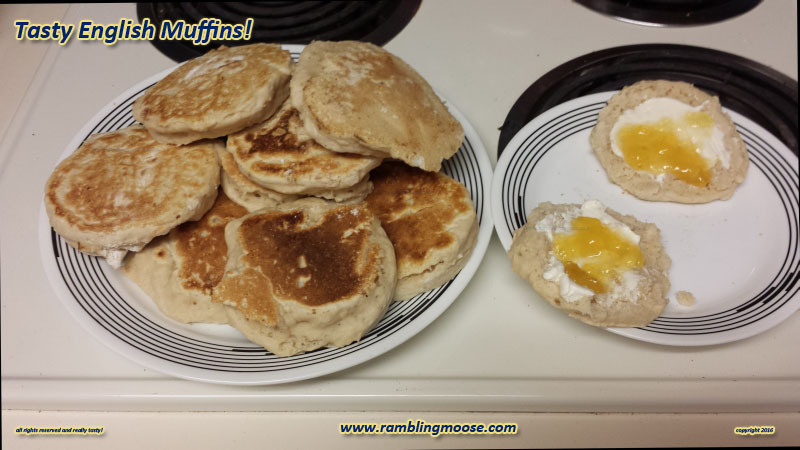 Yep, English Muffins from a bottle of beer and some Self-Rising Flour. If you are patient, and cook them well, they actually have a pretty good texture. A Wee bit Soft, but that's the nature of a Beer Bread. So, the original write up below has been tweaked. A while back, I got to try a Beer Bread recipe. Beer bread is one of those things. It doesn't make a bread so much as a muffin that people pretend is bread. There is normally way too much sugar added, they tend to use fruit and spices to hide the taste of the beer, and it just isn't what I would call "Bread". Sure, you might, but you also will admit it just isn't the right texture for sandwiches. However, it is tasty and very easy to make. I got involved hacking the recipe and came to some conclusions. First, the sugar is DEFINITELY optional. My original recipe was three tablespoons to the batch. I was able to reduce that to 1 tablespoon and I will be making this again and leaving the sugar out. I did, as I said above, and it tastes really much better as an English Muffin - which shouldn't really be all that sweet. Second, the leavening is "mechanical". It's all from the carbonation in the beer hitting the salt that is in the self rising flour. You can use soda if you prefer to avoid the little bit of alcohol in a beer bottle. Sure, take all the fun away! But the use of soda also will add flavor to the bread. A Black Cherry soda used in a beer bread would go well with Raisins or dried Cherries. to give me a nice pile of English Muffins. Basically they came out like a tall pancake. I ended cooking them until they started to bubble through the batter in the rings. The rings are optional, by the time I got to the middle of the batch I was just dumping 1/4 cup of batter onto the hot griddle and waited. It is up to you whether you want to use the rings, I have crumpet rings and will use them. The batter seems to be a little on the dry side for Crumpet Rings. It all goes together very quickly since you don't have to wait for it to rise, and you don't want to stir this mix too quickly or too vigorously because you will deflate your batter. Nobody wants a deflated batter. 1 Tablespoon sugar - Optional and to taste. 1 can of room temperature beer, 12 ounces. Add the self rising flour to a large mixing bowl. Sprinkle the sugar on top evenly and lightly mix the two ingredients with a fork. Pour the beer on top of the mixture and gently mix the batter with a scoop or a paddle. Do not mix the batter vigorously, but make sure that the flour is evenly mixed in. Oil your skillet and crumpet rings (optional) with a towel and preheat the rings before cooking. Note: At 375F and using Sesame Oil, I had zero smoking. Check your oil smoke-point before cooking. Wikipedia has a great reference for this! Pour 1/4 cup of batter onto the skillet and cook until golden brown or bubbles begin to show on the top side of the muffin. 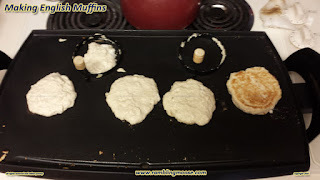 Flip the muffin and cook the tops until golden brown. 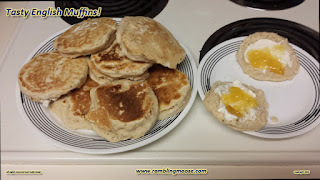 Split and toast and serve as you would your favorite English Muffin.